Faces of innocence with the musical and lyrical savvy of the guilty. 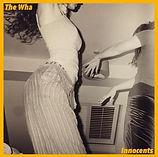 The Wha introduce themselves to the general public with a confidently dramatic call to charms, their debut single ‘Innocents‘. From a light tight beat, layered instrumentally, tier upon tier into a punk passioned, Elvis Costello-esque sneerpop classic. ‘Innocents’ then sprawls out into a crescendo of epic-anthemic with vie-ing vocals, kit and guitars only pausing for enough breath to deliver killer prose. Then they race each other in perfect time, to leave you hooked before three minutes has passed. Dafuq? What just happened? Kilkenny’s teen spark rockers are getting all the classic and new buzz band comparisons, early days, but have casually showcased enough composition and delivery skills with this debut to set up their own world. Thanks to this single being released on the same day that school children added some hope into the balance of politics (15th February), and with 3/4 of The Wha yet to leave school, we’re going to say, for the first time in ages, the future looks (and sounds) bright. ‘Innocents’ : Straight on TheZineUK’s Newer Wave Rocks playlist!